As the warm weather quickly approaches and the risk of exposure to Lyme-infected ticks heightens, so does the push for a new vaccine to prevent Lyme disease. Experts widely acknowledge Lyme disease, a tick-borne infection caused by the bacteria Borrelia burgdorferi, as the most common vector-borne disease in the United States and Europe. According to the Centers for Disease Control (CDC), cases of diagnosed Lyme have steadily risen in the United States, with 300,000 people infected every year. Although past efforts to successfully develop and distribute a vaccination left the world disappointed, recent research promises more bountiful results. One of the latest vaccination efforts was conducted by Maria Gomes-Solecki of the University of Tennessee in Memphis and co-founder of the Tennessee-based company U.S. Biologic. Using a strategy modeled after the LYMERix vaccine, which was pulled from the market in 2002 after four years of sales for allegedly causing damaging side effects, Gomes-Solecki and her team developed an oral solution with a different target: the white-footed mice. Lyme disease experts from the National Science Foundation point to the white-footed mouse, a rodent native to North America, as the key reservoir for the bacteria that causes Lyme disease, Borrelia burgdorferi. The mice are the crux of Gomes-Solecki’s vaccine. 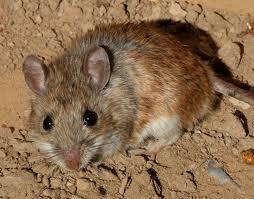 The white-footed mouse is the Lyme reservoir targeted by the U.S. Biologic-funded vaccine. According to her study published in The Journal of Infectious Diseases, Gomes-Solecki theorized that if young ticks ingested the blood of mice that had been vaccinated against Borrelia infection, they would ingest the mice’s antibodies against Borrelia, thereby eliminating the bacteria from the tick as well as preventing further transmission. She developed the pellet-sized vaccine, called a Reservoir Targeted Vaccine (RTV), based on the outer surface protein A (OspA) of the bacteria, which triggers an immune response in the mouse. In a five-year trial of the vaccine beginning in 2008, Gomes-Solecki and her team baited four plots of grassy area in New York with the pellets and compared the infection rates of ticks found there to those found in four other grassy plots that had not been baited. The different plots had reductions of the number of infected ticks ranging between 23 and 76 percent. The researchers found no evidence that the pellets caused any harm to the environment. Gomes-Solecki said that while the pellets are aimed at attracting the most common reservoir of the Borrelia burgdorferi bacteria, the white-footed mice, the vaccine would also be be consumed by a number of other small mammals, such as chipmunks and squirrels, who may also carry the bacteria. U.S. Biologic is currently pursuing USDA approval for their pellet vaccination, which if approved will be marketed to homeowners to sprinkle in hot-spot areas where ticks typically dwell. The pellets, Gomes-Solecki said, will be priced affordably and could be used by homeowners in conjunction with everyday rodent traps. Even though the Reservoir-Targeted Vaccine uses the same protein as the 1998 LYMERix vaccine did–the OspA protein–the alleged side effects that caused LYMERix to be pulled from the market would be avoided. 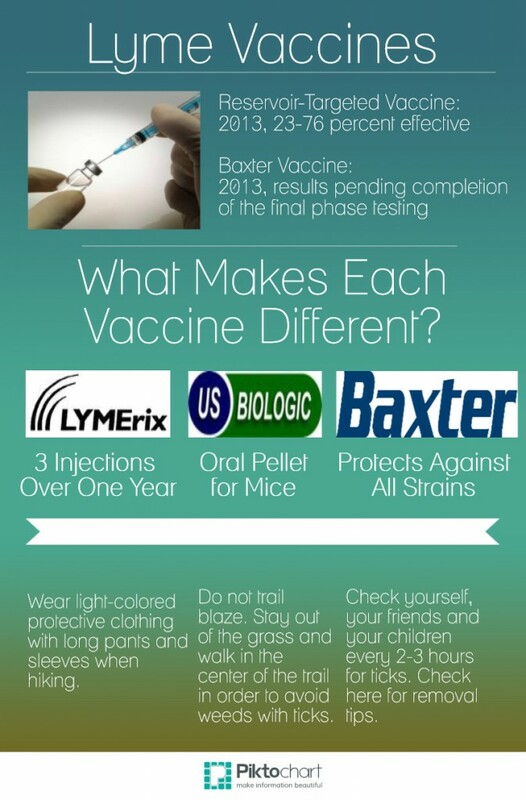 While LYMERix was used as a human vaccine, people would not be exposed to the Reservoir-Targeted Vaccine. If approved by the USDA, the RTV is expected to hit the market by 2015. In May 2013, hopeful results for another new Lyme vaccine were published in The Lancet Infectious Diseases. Funded by the Illinois-based healthcare company Baxter International, and developed by researchers from Stony Brook University and Brookhaven National Laboratory, this vaccine, based on a unique set of bioengineered OspA proteins, attacks the Borrelia bacteria in the tick’s gut before it can be transmitted to humans. The news release from Brookhaven National Laboratory Newsroom reported that this vaccine, like LYMERix, requires three primary immunizations and one booster dose to be effective. According to the Dr. Benjamin Luft, of the Stony Brook University School of Medicine and producer of the 2009 documentary that reveals the history and prevalence of Lyme disease Under Our Skin, the key to finding a successful vaccine is to bioengineer a protein not found in nature. This theory, he says, is the basis for his vaccine with a new fusion called chimera that contains proteins from a variety of Borrelia bacteria. The advantage of this particular vaccine, he says, is its ability to attack the range of different disease-causing strains of the Borrelia bacteria that occur in ticks throughout Europe and North America. The vaccine was tested for safety and effectiveness on 300 volunteers in Austria and Germany between 2011 and 2012. The vaccine, Luft said, showed no major side effects and triggered a healthy immune response to the debilitating bacteria. One more trial is needed before the testing of this new vaccine is complete. Do We Really Want Another Lyme Vaccine? Since the failure of LYMERix, many drug and pharmaceutical companies have been reluctant to get involved in the hunt for a new Lyme vaccine. Despite the growing prevalence of the disease, they say the medical need for vaccinations against other diseases is much greater than for Lyme. At the same time, anti-vaccine advocates in the community argue that the potentially debilitating side effects of a Lyme vaccine outweigh the benefits. Developing a truly safe vaccine therefore requires much longer clinical trials than vaccine researchers currently conduct. “Those conducting the vaccine clinical trials would have to wait years to see whether chronic symptoms developed in those participating” in the experiments, she said. Other Lyme experts disagree. Mayo Clinic vaccinologist Gregory Poland says the scientific know-how to develop an effective vaccine is attainable but social pressure is behind the industry’s reluctance. Until an effective vaccine is on the market, though, the public will have to continue to be vigilant against Lyme disease. Checking for ticks. Staying out of grass. While life without Lyme seems to be right around the corner, self-precaution will have to do for now.